The recent weeks saw an array of new and re-editioned publications on Niki de Saint Phalle (1930 – 2002). In addition to the informative and beautiful catalogues describing the current retrospective exhibition at the RMN-Grand Palais in Paris, original artist books from the 1970s, a contemporary comic novel devoted to Saint Phalle’s life and a new film documentary on her architectural works were made public. Seasoned Film makers Louise Faure and Anne Julien envisioned and created a new documentary titled Niki de Saint Phalle. An architect’s dream. It just received an award for “Best Documentary in the Arts” by the International Festival of Documentaries of the Arts and Architecture in Rome, Italy. The film is a production of RMN – Grand Palais with the French TV5. 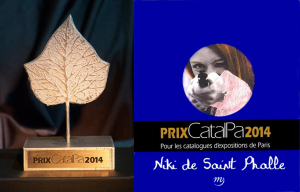 In 52 minutes the film maker duo, that has also created the 2012 documentary Niki de Saint and Jean Tinguely. Bonnie and Clyde of the arts, takes their audience on a striking journey to discover Saint Phalle’s monumental projects worldwide and illuminates them visually and art historically from new angles. The Grand Palais is currently showing the film in their auditorium until the end of the exhibition on 02 February 2015. The DVD is also available for purchase in NTSC format (French/English). The Retrospective Exhibition Catalogue, co-written and edited by pronounced curator Camille Morineau, won the prestigious CatalPa Prize for “Best” of 62 Parisian exhibition catalogues in the year 2014. The heavy book is filled with insightful essays by international scholars (Patrick Andersson, Laurence Bertrand Dorléac, Emilie Bouvard, Bloum Cardenas, Catherine Dossin, Nathalie Ernoult, Catherine Francblin, Catherine Gonnard, Amélia Jones, Ulrich Krempel, Kalliopi Minioudaki, Lucia Pesapane, Alvaro Rodriguez Fominaya and Sarah Wilson), an extensive chronology, poignant quotes and large illustrations that place Saint Phalle’s life and œuvre into the historical context of contemporary art. Though currently only available in French, the catalogue is expected to be published in English and Spanish for it’s next venue, the Guggenheim in Bilbao, Spain. CONGRATULATIONS and THANK YOU to all involved parties creating, designing, writing, correcting, contributing and permitting to the success of these award-winning publications. Vive Niki! Two rare artists books from the 1970’s were reprinted and made available by Éditions de ‘Amateur. Saint Phalle’s stylistic crayon drawings tell stories of The Devouring Mothers (published first in 1972 by Gimpel Fils), or ask to Please give me a few seconds of your eternity (published first in 1970 by Sergio Tosi). Behind the colorful, and often comical first look of her drawings, thoughtful statements about familial and amorous relationship are made by the artist. A short and well-illustrated biography by Morineau titled Niki de Saint Phalle (2014, Éditions Gallimard) supplements the exhibition catalogue and elaborates on the authors’ curatorial understanding of Saint Phalle’s oeuvre. Assistant curator of the Retrospective, Lucia Pesapane, who also currently conducts research for the online Nana Catalogue Raisonné for the Niki Charitable Art Foundation, authored two publications. 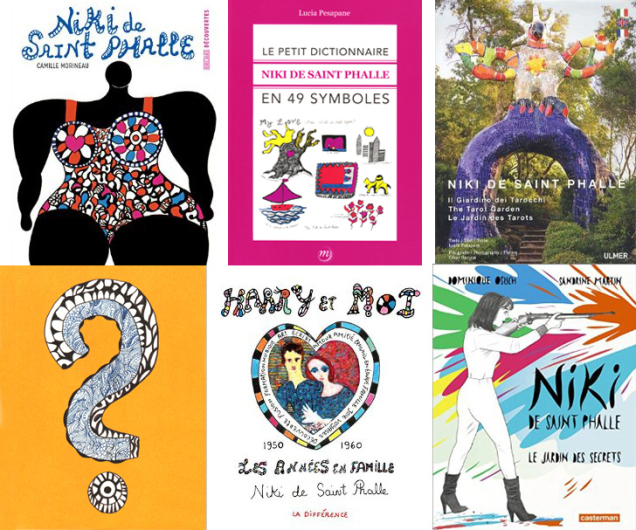 Le petit dictionnaire: Niki de Saint Phalle en 49 symboles aims to give understanding to visual representation and repeated designs in Saint Phalle’s œuvre. From brides and dragons to guns and hearts, naturally not forgetting the infamous Nanas, Pesapane weaves theses symbols into an art historical context highlighted with quotes by the artist herself. Niki de Saint Phalle. The Tarot Garden is a trilingual discussion on Saint Phalle’s interpretation of the traditional Tarot Cards and the subsequent creation of her sculpture garden. Published by Éditions Ulmer. Saint Phalle’s two autobiographies Traces: Remembering 1930-1949 (1999) and Harry and Me: The family years (2007) were republished for the French audience by Éditions La Difference, whereas the latter book is now available in French for the first time. A higher-quality printing process allows for these republications to illustrate the artist’s drawings in their original brilliance. Saint Phalle narrates her upbringing and influences on her path to becoming an artist in a conversational style that is both insightful and entertaining. English and German versions are available on the secondary markets. Niki de Saint Phalle. Le Jardin des Secrets is the first extensive comic-style biography envisioned stylistically by authors Dominique Osuch and Sandrine Martin. In 22 chapters that correspond to the 22 cards of the major arcana of the Tarot Deck, the authors follow Saint Phalle’s life chronologically to illustrate events leading her on her path to becoming the prolific artist she was. Though only available in French, non-speakers can easily understand the personal and artistic growth Saint Phalle undergoes from the comprehensive drawings and play with colors. Published by Casterman. Details to all publications can be found on our website.